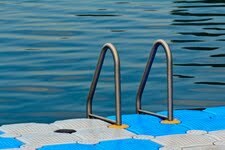 Hobbs & Porter can supply bespoke stainless steel swimming pool handrails throughout the UK. 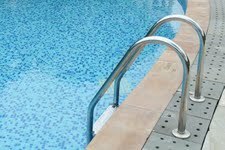 Stainless steel handrails and access steps to swiming pool with dark and light blue mosaic tiles. Stainless steel handrails fixed to floating pontoon in the sea. 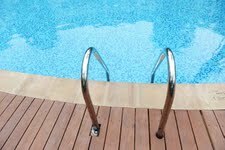 Stainless steel handrails at swimming pool with hardwood decking.